Scalloped potatoes are an all-time favourite side-dish. 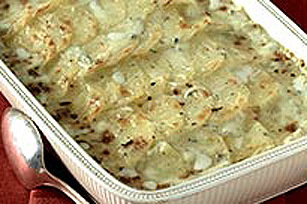 We've dressed them up in this Blue Cheese Scalloped Potatoes recipe - these scalloped potatoes are the perfect side for roast beef or a festive turkey. Microwave flour, butter and milk in large microwavable bowl on HIGH for 6-8 minutes, whisking every 2 minutes, or until sauce is slightly thickened. Stir in blue cheese and salt, until sauce is smooth. Layer half the potatoes in a 13 x 9 inch baking dish, sprayed with cooking spray. Top with half the cheese sauce. Top with remaining potatoes and sauce. Cover with foil. Bake at 425°F for 30 minutes. Remove foil and bake an additional 45 minutes, or until potatoes are tender. Slice potatoes as thin as possible, so they cook quickly and evenly.